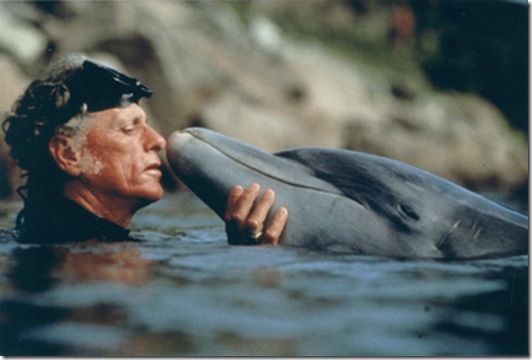 Richard O’Barry, former trainer of the five dolphins who stared in Flipper, has become one of the most fervent and most active advocates for anti-captivity. He is most well-known today for his work in the documentary The Cove, which explores the mass slaughter of dolphins in Taiji, Japan.I had the chance to interview him in front of the dolphinarium in Bruges, Belgium during the World Week of Action for Captive Dolphins in 2004. 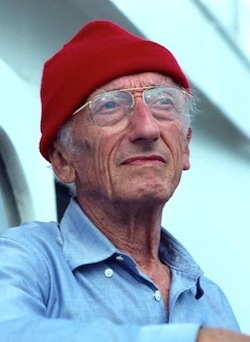 During this interview, he explained to me the reasons for his work and, among other things, his point of view on controversial topics such as intelligence, captivity, and the military use of dolphins. Q : When did you start working with dolphins ? A : I started working with them in about 1961. I was the head trainer at Miami Seaquarium for the dolphins and the killer whales. But in 1970, I started working against that industry that I helped create. Today I work for a great French animal protection group, One Voice. Q : What motivates your special interest in dolphins today? A : I feel responsible for helping create this multi-billion dollar dolphin captivity industry so I’m very motivated to do something to help stop the traffic in captive dolphins. The real work started when Flipper died on the eve of the first Earth Day in 1970. I have been trying to educate the public about this issue ever since, in hope that they will respond by refusing to buy a ticket to a captive dolphin show. 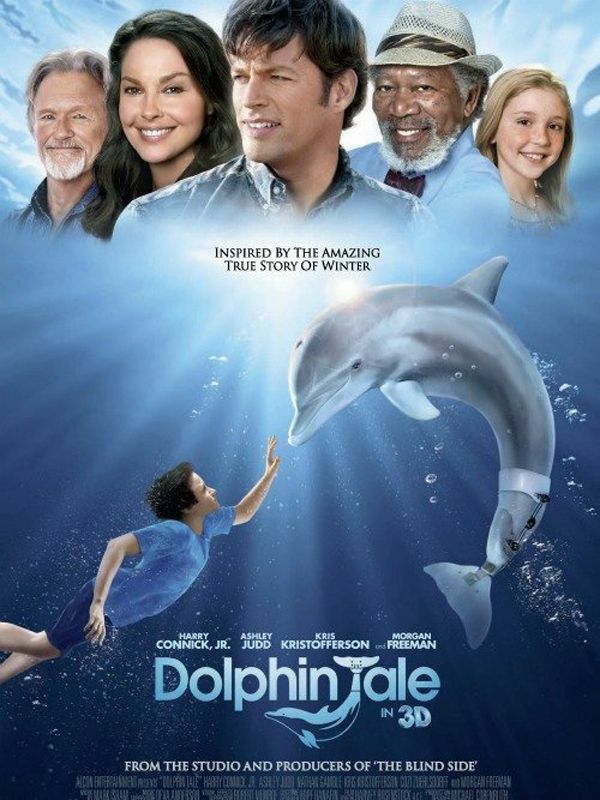 Q : In the TV series, Flipper projected a certain image of dolphins. How would you describe this image of the dolphins that led to “dolphin mania,” if I may describe it that way, during the 1960’s ? A : Well, that’s true, actually there was dolphinmania to some degree, but it is more prevalent now than during the 1960’s. In the 1960’s, during the Flipper years, dolphinariums were a very small industry. There were only three or four places that displayed dolphins. Today it has become a multi-billion dollars industry, probably in part because of Flipper’s popularity. The success of the popular TV series has a lot to do with the traffic in captive dolphins and the image of dolphins. The image that is projected by the dolphinarium industry, places like Asterix Park, Marineland in Antibes and Sea World, etc, is that of a circus clown. And I think that that does a considerable amount of damage to dolphins and nature in general. They call this abuse education, but unfortunately for us and the dolphins, it’s a form of bad education. Q : Do you think that this image of friendly dolphin projected by dolphinariums is accurate? A : No I don’t. These are wild animals, like wild lions, tigers, elephants. Wild and forever free. That’s the image they should really have and keep. Unfortunately, the true image has been changed by the dolphinarium industry. The general public now see dolphins as performing circus clowns, a friendly creature that is here to amuse us. Q : When did you started working for the US Navy ? A : I was in the Navy from 1955 until 1960. I was part of an anti-submarine hunter-killer group during those years. Q : By the way, I have heard that dolphins have been used during WW2. Is it true or false ? A : No, it’s false. The dolphins were conscripted into the Navy around 1959. That’s quite recent. US Navy dolphins were used in Vietnam, but not during the Second World War. Q : How were the dolphins considered in the Navy ? They’re called Advanced Biological Weapon Systems, have the dolphins always been identified by that name? A : Yes, that’s the name the navy gave them, it’s always been used. That should give you an idea of how they are treated. The dolphins are considered “systems” in the military, disposable systems for a disposable society. Q : And what was their status in the Navy? Were they like marine dogs of war or more like “soldiers”? A : Yes, both. They were quite like “the dogs of war.” These are “the dolphins of war.” They’re used to detect mines. In Vietnam, they were used to protect the harbor. Even the Russian navy used dolphins to guard submarines and other ships in different parts of the Black Sea. Q : There are a lots of rumors about navy dolphins, since the research was kept secret until the 1990’s. Is it true that there were programs to train “killer dolphins”? A : I think it’s true… actually I know it’s true. In Vietnam, there were 13 dolphins that were in Camron Bay. I knew the dolphins, they kept them at the US Navy base in Key West, Florida. I monitored them very closely..
Q : When did you became a anti-captivity militant ? Was there a special moment ? You said it started with the death of Flipper. A : Yes, that was it. It was on Earth Day 1970, the first Earth Day. 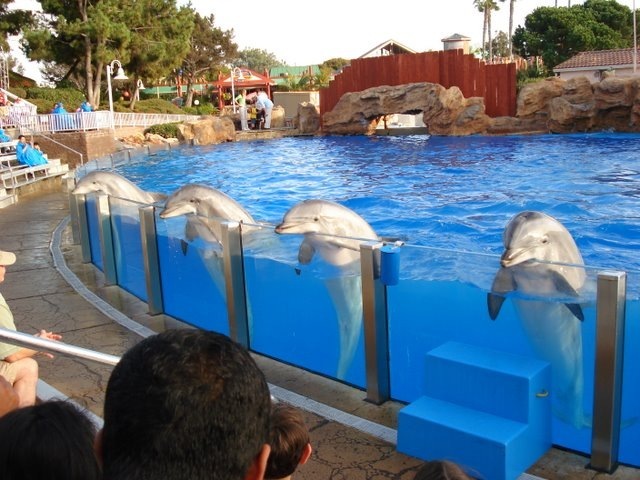 Q : Do you think that scientific research justify captivity for the dolphins ? Q : You said in another interview that dolphins’ intelligence was not higher or lower than humans’ one, but simply different. Nevertheless, do you think we could communicate with dolphins one day? There was a Human/Dolphin communication project as I recall. A : Yes, I’m very familiar with that project. I think we are a long way from real communication however. We haven’t even learned to communicate with each other as a species yet. We should accomplish that first. And we have to establish what communication really is. You know, many stories of dolphins that have saved people who were drowning in the sea. That is communication as I see it. Q : Many stories of dolphins that have saved people who were drowning in the sea, are these stories true? A : These stories go back to the Greek period. We have good documentation of dolphins saving the lives of people who were in trouble in the sea. I have witnessed this twice in my life, so I know it’s true. I think that this altrustic act is a form of communication. A : Yeah, I hate that place. People who really know really what goes on there call it the Dolphin Riding Center; it’s not a real research center from what I have seen. The captive dolphins there do tricks for food. If you don’t have food to give them, they’re not interested in people. All captive dolphins are controlled by the food. If you didn’t have the food reward the dolphins wouldn’t cooperate and let people get into the water and kiss, and swim with them, and do all those silly tricks. They only do that to get their food. Q : What do you think about dolphins’ intelligence ? A : You use the word intelligence, that’s a man-made concept. For example, from the butterflies point of view, I’m not very intelligent at all. I can’t do any of the things a butterfly can do, so… It’s a human concept. Q : Do you think that this conception we have of dolphins intelligence is a decisive factor in the revendication of rights for them ? A : No, I don’t think so. Dolphins and other animals have no rights under human laws. I don’t see much protection going on. I don’t know of very many marine mammals scientists, for example, who are protecting marine mammals. Most of their work is about counting how many there are left… And so, society needs to have groups like One Voice protecting the dolphins. Too many marine mammals scientists are connected to the multi-billion dollar dolphinarium industry. Most of these American scientists are taking money from the Office of Naval Research, so they can’t speak out about the abuse. They won’t get their grant money from the navy if they do. Q : About the revendication of rights for the dolphins, do you think that there should be a protection, of their lives, of their freedom on the wild… ? A : Yes, I do. I think that they should have… They already have “birth rights”, like humans have birth rights. The fact that we’re able to walk down the street without being attacked. This are the rights we’re born with. Shouldn’t the other animals have the same protection, why not ? I think it’s the dolphins birth right to swim in a straight line mile after mile in the ocean without being attacked, captured, or killed. Q : Are you in favor of protection for all animals ? A : Absolutely, yes. I only worked with dolphins, but that’s just because I have a special relationship with them. I don’t think the dolphins are any more or less important than the sharks, for example. You know, the shark is to the ocean what the lions are to the Serengeti Plains in Africa. Without the sharks in the ocean, the dolphin would not even exist. The ocean would not even exist. So, it’s all connected. I happened to work with dolphins, but the dolphins is not anymore important than anything else. Q : What do you think are the best means to protect dolphins ? Is it education, or action? A : Both are important. There is no magic bullet that can be used to solve all of the threats to animals. I would tell people in France to join us at One Voice. We do both, education and direct action. This group is actually doing something worthwhile, it’s not a business. It’s a passion with the One Voice team..
Q : By the way, how many dolphins did you free ? A : Oh, I never counted… Maybe 20 or something. I don’t know. 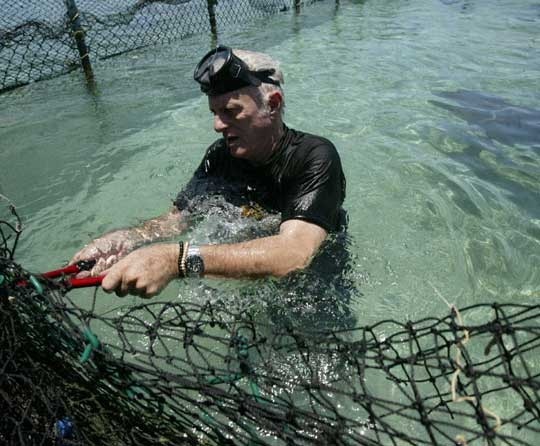 A : Yes, we did free the two former US Navy dolphins, but they were recaptured. Q : Yes, just a few weeks after. Q : Who were the others dolphins you freed ? A : Let’s see….there was Liberty and Florida in the Bahamas, Opo in Biscayne Bay, Miami…There was Joe and Rosy in Georgia, Nica and Bluefield in Nicaragua, Ariel and Turbo in Guatemala, Flipper in Brazil, several more… I’ll send you some information. I have some articles someplace. Q : Is the attitude of people in the US towards dolphins changing at all? A : No… Unfortunately, our relationship with dolphins seems to be all about what dolphins can do for us. Most of the people that are interested in dolphins, are interested in what dolphins can do for them. It’s still a utilitarian relationship that we have with dolphins. America is a nation of insatiable consumers, they want what they want, and they want it right now! Q : You also witnessed to the killing and capture of dolphins in Japan, and filmed it with One Voice. Do you think there should be international legislation for dolphin protection ? A : Well, I think that international pressure on the Japanese government would be faster than legislation. That’s what One Voice is doing. We shot nine hours of video, and we’re condensing it into a thirty minute DVD. We’re going to send to the BBC, CNN, France 1 and France 2, and to all the newspapers and television stations that we can. I hope that some of these journalists will come to Japan with us when we return in October. It’s the kind of exposure tat the Japanese government doesn’t want. And maybe that would be faster than legislation, and a more effective way to bring pressure on the Japanese government to finally abolish this barbaric practice. Q : What do you think of the movements that demand application of human rights for the dolphins (and more generally for cetaceans) ? What do you think for example of those who want to apply the Great Ape Project to the dolphins ? Q : It’s equivalent to “written” birth rights. A : Y es, I’m in favor of anything like that. Let’s do it! Q : Are you favorable to a declaration of rights for them? A : Like a declaration of animal rights ? Yes, I think it’s a good idea for all living things. Q : Do you have anything to add upon that subject of dolphins rights? A : It’s hard to sum up in a few words. The best thing to do is to leave the dolphins alone. We can’t seem to leave them alone, that’s the best thing we could do. Q : How can you bring humans and dolphins closer together? A : I’m not sure we should be closer. There is a natural distance between humans and wildlife, and we just can’t seem to respect it. When you go out into the jungle, or in Africa, or in the ocean, wild animals, by nature, avoid people. They hide from us. This is a form of communication too–they are telling us something, but we are not listening. We are too busy trying to get what we want. We have to learn to respect nature. We think we have to get closer, to touch them and kiss them, and that’s the problem. Why can’t we simply leave them alone ?